This 1776 Colonial Dollar, sometimes referred to as a Continental Dollar. This coin is special as it has the word Currency misspelled as “Currency”. It that was dug about nine inches down and it rang up as “pewter” with a touch of silver. I know this because my XP DEUS was bouncing back and forth between the two. As the story goes, this spot was a Trading Post thirty years before this town ever was founded. My friend told me that a driveway sat there for years but later was moved. This helped explain all the gravel around it when I dug. As a result, this coin is bent up all over and very worn, but has a Loop on it that someone had soldered using silver. At that time, I wasn’t sure what I had but I remember thinking it was a token. I thought this because 35 years prior to this, Wild Bill and I found one. 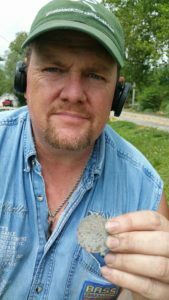 We were metal detecting and found one also with the Loop on it. He said it was a token but man that date seriously had me trippin. I showed it to my friend and told him I was going to follow up on it. It is so RARE it’s most likely a reproduction according to the internet. Did I Find Some Rare US Currency? Several of my friends said i should take it to a certain coin shop in Kansas City because the owner was the best there is for Identifying coins. Upon my arrival, at this glorified pawn shop, this feller took one look at it, handed it back and said “its a fake”, boy that impressed me, Interestingly enough though, he offered me $500 for it before we left. My next stop was ANACS, they asked me to go have it weighed. So i took it to the local jewelry store, and in this corner, weighing in at a whopping 15.27 grams, a contender! The ANACS said that it was within range for a Continental Pewter Coin and asked if i would email some pictures to them. A few days later i received a reply asking me to describe the coin, mainly the edge. Have you ever tried to describe a coin? Lets just say, I’m not very good at it. So i called the ANACS and was told, the problem is, the pictures i sent wasn’t clear enough to identify specific characteristics to justify spending Ten Thousand Dollars to have it graded but they recommended a coin show in ST. Louis this coming weekend. ANACS also said their experts were about 50/50 on its authenticity. Honey! Road Trip! Mental Note: Don’t ever book a motel that turns out to be “sucky” the weekend of a major league baseball game, needless to say we slept in the buggy in Walmart Parking Lot, GOOD TIMES! Once we did come to, we found the coin show in St. Charles, apparently a suburb of St. Louis. At the coin show, my first objective was to find Heritage, but of course they bolted the day before our arrival. So i talked and showed the 1776 Colonial Dollar to about a dozen folks in all. Six referred me to someone they thought would have a better idea of the coin and of those Six,Two called it a “reprint” one said it was a “fake”. The other three was very impressed with it and said “I highly recommend you send it in” to be graded is what they were implying. One other feller said “I’ve looked at thousands of these but i really hope those people got a second opinion because not all of them could have been fakes”. Another gentleman piped in and said “there you have it, the first rule of coin collecting, Send It In”. Unfortunately my friend passed away before i could share these findings with him. Check back later to see what else develops on this HOLY GRAIL of COINS.